Nice!!! Thank you good sir! May have found my answer. Seems like it isn't really needed for a battery only circuit? Hi Jason, Mark is away till the weekend so I guess he'll answer any questions when he's back. "But in answer to your question yes the other 47u is a power supply filter cap and wouldn't be required with a battery. You could still add one if you wanted, just put it from the first to third row on the right hand side of the board above the trimmer, and daisy chain the ground wire to go from the bottom to the third row. Also remember the positive side of the cap would need to go to ground. " I flipped the 47µ and used MP38A (measuring 85 hFE), thus making it NPN negative ground. Very versatile and amazing sounding booster. This was my first brush with rotary switch, but gladly those are quite simple to comprehend - and your image did help a lot :).. With the bassiest 150n cap on board it pretty much sounds like all the ODs that are trying to mimic Marshall 18. Which is not a bad thing at all. For the reference, the trimmer set at 1,82K gives out the sweet spot for me and that particular transistor. This will get a high spot on the list for to-be-boxed. Mind the pinout. I used thin heat shrink for the legs.. I noticed that the bigger caps on board and high output pickups on guitar give out lots of saturated, broken sounding overdrive. When guitar volume is decreased 2-6%, the amplification clears up. Stock rangemaster cap doesn't break it - that sounds pretty much 1:1 with my AC127 rangemaster. I thought about swapping the MP38A for one with higher gain, but blaah. I'm not going to bother. It's like it is. And it rocks. And has lotsa Mojo, with capital M.
Also, the 'symbol' on the bottom right of the populated vero is a trimpot maybe? Judging by the positions of the 'legs' I'd say it is, just I haven't seen that before. What size load would you recommend? Any help appreciated. That was quick! Thanks Mark! just a little explanation about the wiring. We assume that the input must be wired to the "A" pole of the rotary switch, and then the 6 associated lugs respectively to the board, as shown in the picture. So, where should I wire the Input wire shown on the veroboard picture which is directed to the 1M (pulldown, I suppose) resistor? 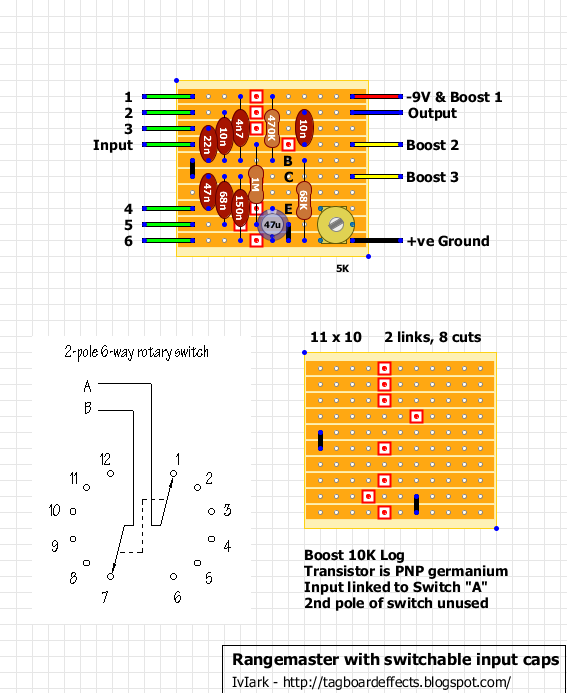 Just daisy chain from A on the rotary switch, or alternatively you could put the pulldown resistor directly on the stomp switch between the board input pole and the ground lug for the LED and then leave it off the board entirely. To use an NPN transistor with this, is it just a simple case of swapping the 47uf cap direction as Miro said or is there more to it? I've managed to end up with a lone NPN Germanium with usable leakage and I thought this would be an excellent project for it. After having had a mess about with the booster I'm now trying to get it biased properly. I've done a bit of reading on Geofex and one of the articles suggests biasing the collector to around -7 (I'm guessing that will be +7 for me) should there be a noticeably better sounding spot or is it just a case of getting the voltage to 7v. Sorry about all the questions it's the first time I've done a circuit that's required manual biasing. Tune it by ear. When it sounds good, you'll hear it. Bias voltage is crucial on most JFETs to get them working correctly. Here that's not as important as different germaniums need different voltages to sound good. Thanks, there are some sections that sound really bad and the spot I had it set to sounded about right so I figured it wouldn't really matter if it wasn't bang on 7v but I just thought I'd check. Thanks again. I'm on a PNP Ge roll! Just built this. MP20A, 100 hfe, biased to about 7v. Sounds damn good. Used a voltage inverter. I'll post pics when it gets boxed. Thanks again! Sounds freaking awesome. Thanks again. Ended up with a 77 hfe, MP20A. Biased closer to 8v. First time I ever put a rotary in a 1590A. Fits nicely, actually. Ha! No aggravation really. More of a fun challenge. Gets kind of easy after a while. All my 1590A builds work great, and have noise issues. They are great for touring. I can bring my pedalboard on the plane in a backpack thanks to these small pedals (and super flat pancake patch cables). Thanks. The rotary actually fits really well, and left just enough room for 9mm pots above it. I could have even put two pots up there, but the circuit only needed one. And since the rotary only required half its pins, I clipped off the other ones, which left the perfect platform for the voltage inverter to sit on (with a bit of velcro). It might look a bit sloppy in there, but everything is solid and stable.